There are two versions of the game Bookworm for Nintendo DS systems. Version 1: There is a fully-featured version was released to retail store on a Nintendo DS cartridge. Version 2: There is a more basic version is available as a download via Nintendo's DSiWare service (DSi & DSi XL systems). Only the the retail version (on a Nintendo DS cartridge) has Single-Card Download Play. All of this information is only valid for the retail version (on a Nintendo DS cartridge). Navigation within Bookworm is simple and new and casual players are kept in mind. After entering the profile, "Multiplayer" is right on the main menu and is followed by "Single Card Play" on the Multiplayer menu. The opening credits are average length and the download time is approximately 45 seconds. The menus are touch-based, but also allow for button navigation (even though button navigation is awkward due to the system being held vertically like a book). The selectable options are separated with plenty of buffer space and are clearly labeled. The basic control scheme involves tapping letters one at a time or drawing a line that connects them. The basic premise is simple, and works well... most of the time. The letter tiles are small, so a stylus is pretty much essential, and it's easy to accidentally highlight an extra/incorrect letter and need to backtrack. There is no left-handed option, so left-handed players may find the game a little awkward. The Single-Card Download multiplayer features the basic game and the full dictionary, but there are some omissions. There's no downloadable Demo. Players can't choose any options -- target score, time limits (per turn or per game), whether to play on different boards or the same board, etc. Graphically, the game is simple on the playing field and more detailed (but not animated) otherwise. The game's music really doesn't add anything, but the sound effects sound off with five seconds left in a turn or when a turn begins. I went into my review of Bookworm having never played the PC version, and I did so intentionally... I wanted to review the game on its own merits and not as a comparison to other games (something being done far too often lately in my humble opion). I enjoyed playing Bookworm. It's a fun word game that will especially appeal to fans of Scrabble... actually, anyone that enjoys any type of word games. I had a few instances where words weren't recognized. Most "inappropraite" words were omitted, as were alternative adjective versions of nouns. For example: "cite" (to refer to a source) is in, but "citer" (a person who cites something) isn't in. Don't get me wrong, I only saw a few omitted words, but it'd be nice to see the dictionary a little more complete. Other than that, though, I'd say Bookworm is a fun game, and an even better value at the bargain price it was released at ($20 at launch). PLEASE NOTE: All this information relates to the retail version and NOT the DSiWare version. Offer a left-handed option (touch screen on the left). Allow players the choice of taking turns working off the same board. Let players choose their target score, time limit (per turn or per game), etc. in Single-Car Download multiplayer. Expand the dictionary to include more words. 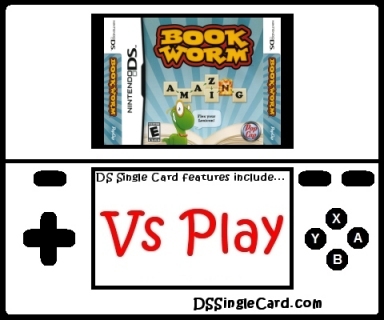 Click here to return to the DSSingleCard.com Bookworm (retail version) profile.